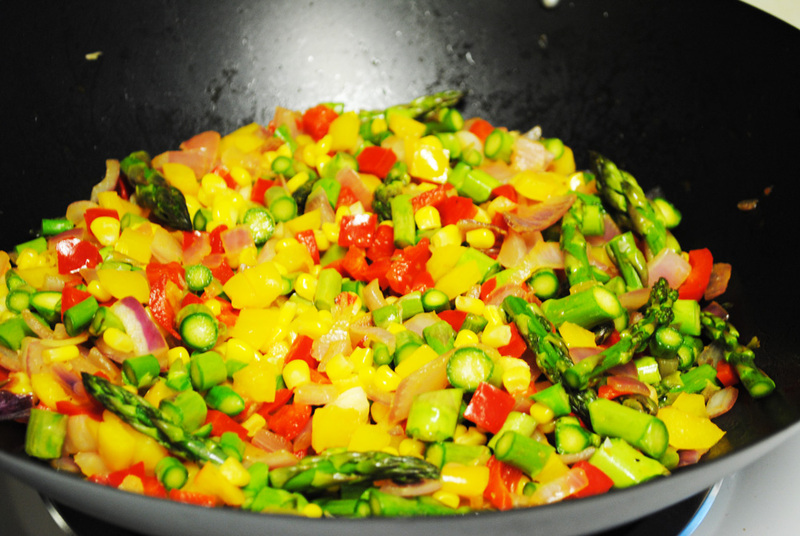 In looking to eat a little healthier, I made this vegetable-filled dish by Rachel Ray the other day. More precisely, my boyfriend made it, and I just took pictures. Also, I am a little weird when it comes to what constitutes a complete meal. A meat (or meat-like product: tofu, chick peas, etc.) and a side are needed to form a happy dinner meal. 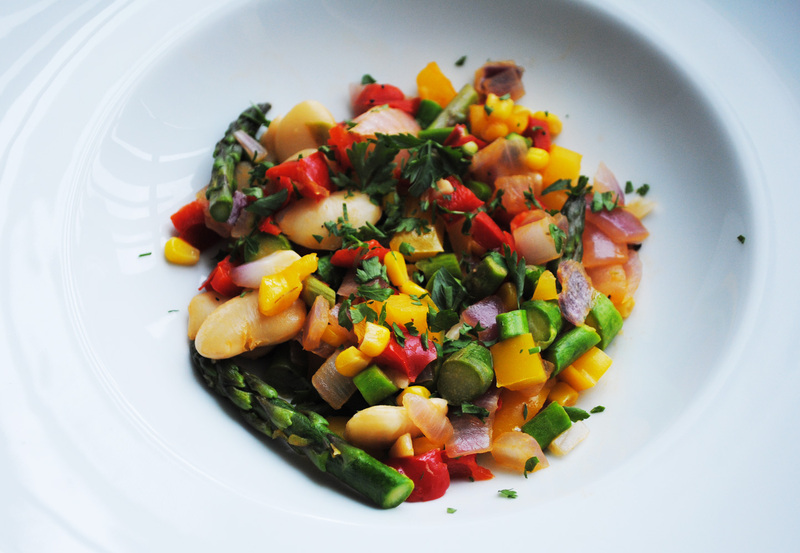 To me, this succotash dish is like a side as it is filled with only side-type foods: vegetables and beans. So, to balance out the meal, I added a cooked hot dog for each of us to act as the "meat". Yes, this may seem weird. Even weirder, it was a naked hot dog, with no bun or condiments. Perhaps even weirder, I put all the hot dogs on one plate and me and my boyfriend just kinda shared the plate while we ate. I must say, the hot dogs used for this occasion are the tastiest hot dogs that I have ever eaten. Nathan's Hot Dogs are that good - that you can eat them totally naked and be in heaven. While I found them to be a little expensive, they are so worth it. Heat a medium skillet over medium high heat. 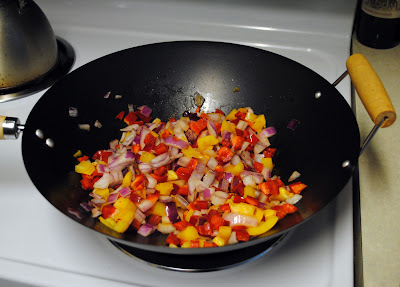 Add oil, onion, garlic, peppers. Saute peppers, stirring frequently, 5 minutes. Add asparagus and corn, cook 3 to 5 minutes longer. 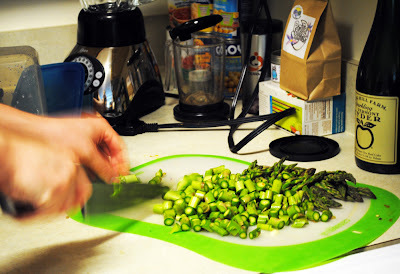 Add beans and heat them through, 1 or 2 minutes. Season dish with salt and pepper, to your taste, then stir in parsley. Transfer to dinner plates or bowls and serve. We really enjoyed this dish. The hot dog (on a nearby plate) added just enough meat taste so I didn't get bored with just the succotash. This looks delicious! And so colorful, too! By the way, I posted my "packing light" blog today from your suggestion - it was fun! Good luck on your trip to Peru in a few months!